Step by step tutorial about how to build app authentication using Ionic 2 and REST API. A comprehensive step by step tutorial on how to build app authentication using Ionic 2 and REST API. We already create a tutorial for email and password authentication using Ionic 2 and Firebase, right now we will implementing authentication using our own REST API server. For accomplished it, you can follow the tutorial in another category. Tutorials above is implementing username and password authentication using REST API with JSON response. Also, you can use your own REST API server of another server that you have an access to it. We use REST API endpoints below for this tutorial. Now, let's create the mobile app REST authentication as client side. As usual, we always start the tutorial from scratch. It means starting with the new and fresh app. Open terminal or cmd then go to your projects folder. Type this command for creating new Ionic 2 app or project. 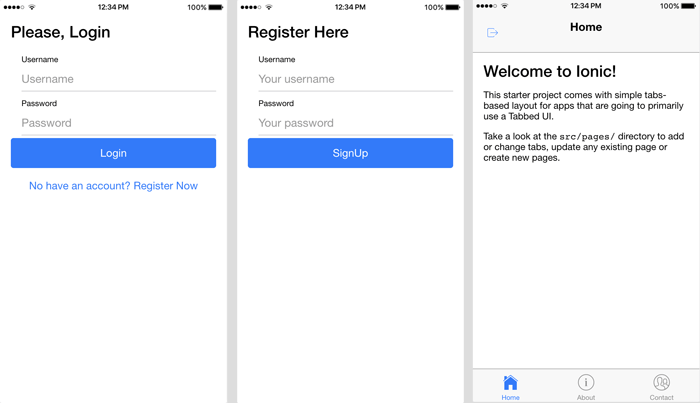 That command will create a new project with the name 'Ionic2RestAuth' with Ionic version 2 and default Tabs view. Go to the newly created project folder then run the app to make sure everything still on the path. It should automatically open and run in the browser. If you see the app view like below that means we ready to move on. Now, create a provider or service for accessing REST API. Type this command to create the new provider. Before doing that, stop the app by pressing Command+C on OS X or ctrl+c in Windows. Next, we will add function for calling login, register and log out REST API. For that, Open and edit file src/providers/auth-service.ts. Replace all codes with this codes. You can change 'apiUrl' constant with your REST API URL. Now, add this provider or service to src/app/app.module.ts in import and @NgModule providers. Now, we will be creating a login page which contains view, controller, and stylesheet. 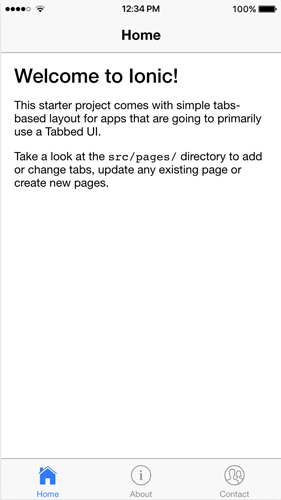 Type this command to create the new page. Register login page in src/app/app.module.ts, add import for LoginPage and RegisterPage. Declare LoginPage in @NgModule declaration and components. Open and edit src/pages/login/login.ts then replace all codes with this. That code adds built-in Ionic 2 module they are LoadingController and ToastController. There is an initial model for hold username and password in the login form. Login function calls AuthService then after successful response token saved in local storage. Next, add HTML tags to login view. Open and edit pages/login/login.html then replace all tags with this. Next, we have to add register function. Open and edit pages/register/register.ts then replace all with this codes. Now, open and edit pages/register/register.html then replace all HTML tags with this tags. Login and Register form above just the basic form. If you like the more complex form you can see in this tutorial. The last thing to complete this tutorial is adding logout function that will put in Home Page and also create a token checker to check if there is no token, the app will redirect to Login Page. Open and edit pages/tabs/tabs.ts then replace all with this codes. Next, open and edit pages/home/home.ts and replace all codes with this. The last, add the log out button to Home Page by adding this tags in nav section. It will automatically open the browser. Now, you can test all functionality of the app that we have been created. If you found any problem with this tutorial. Please, feel free to fill the comment below. Full source code can find on our GitHub.